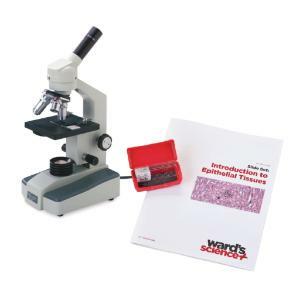 Our Boreal Standard Microscope features all metal construction, a rugged "student-proof" design and precision optics making it a favorite among educators. Features include plain stage, 4X, 10X, 40XR objectives and cordless LED illumination. All Boreal Microscopes are backed by our All-inclusive Warranty that covers parts, labor and shipping costs with no restriction on ownership. Take advantage of this limited time offer. Buy 1 Boreal Standard Microscope and receive our Introductory Epithelial Tissue Slide Set, free! Slide Set includes: Squamous epithelium, frog skin (wm); Simple squamous mesothelium, mesentery (wm); Simple ciliated Columnar epithelium (sect); Stratified squamous epithelium, esophagus (sect); Simple cuboidal epithelium, thyroid (sect). Set of five slides.